December 2, 2014 - Canton, MA – Global fitness leader Reebok today announced a groundbreaking partnership with UFC®, the world's leading mixed martial arts organization. Under the long-term deal, Reebok will become the exclusive authentic global outfitter of UFC, creating for the first time ever UFC 'Fight Week gear' and a 'Fight Night kit' for all UFC athletes. Reebok will also be the apparel provider for millions of UFC fans around the world. In addition to benefiting UFC athletes and fans, the Reebok and UFC alliance also has a significant charitable component. In 2015, promotional efforts will see a percentage of sales from Reebok/UFC product directly benefit Fight for Peace, an international NGO that uses boxing and martial arts, combined with education and personal development, to realize the potential of young people in communities that suffer from crime and violence. "This partnership is much more than a licensing agreement," said Matt O'Toole, President, Reebok. "It is a true collaboration between two great brands, which will not only give UFC a new and exciting look, but will harness the global reach of both brands to also benefit young people around the world, particularly those at risk of being involved in crime and violence." "Together with Reebok we are changing the landscape of MMA," said Lorenzo Fertitta, UFC Chairman and Chief Executive Officer. "Working with another global brand with such a strong history in training and fitness will deliver long-term value for UFC athletes and their brands by elevating and further professionalizing the events and the sport. Every UFC athlete will benefit from high quality performance apparel specifically developed, tested and produced for MMA athletes. Never before has the sport had a global athletic footwear and apparel brand committed to investing so much in the research and development of products specifically for MMA." The Reebok/UFC apparel line, including the 'Fight Week gear,' 'Fight Night kit,' and UFC fan gear, will be developed in conjunction with UFC and its athletes, including current Reebok athletes UFC Welterweight Champion Johny Hendricks and UFC Lightweight Champion Anthony Pettis. 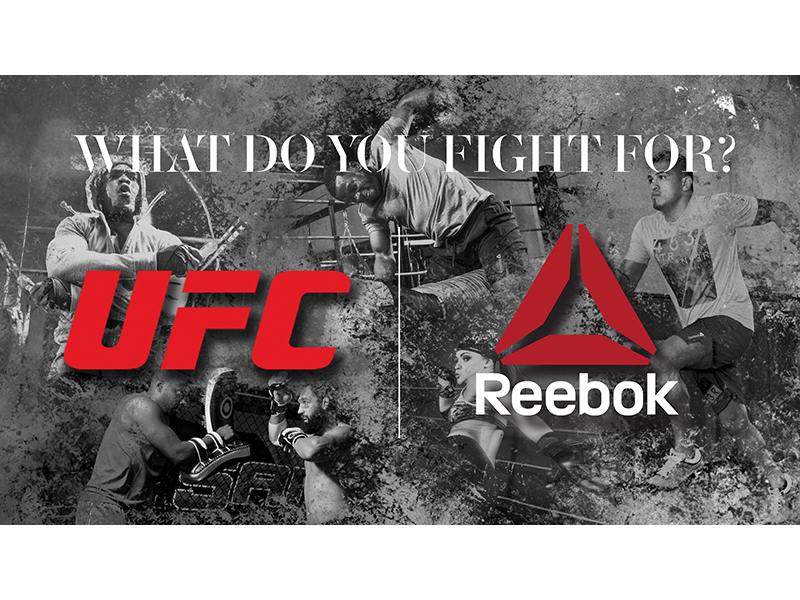 In addition, UFC athletes will be helping Reebok to develop a new fight training-specific apparel collection. "Not only is Mixed Martial Arts one of the fastest growing sports in the world, it is also one of the most challenging in terms of the dedication to training, overall fitness level and mental and physical toughness required. And nowhere is this on display more than in the UFC Octagon," said O'Toole. "This partnership not only further cements Reebok as one of the leading fitness brands in the industry, it will also help us reach a wider audience and become the brand of choice for the more than 35 million consumers worldwide who use disciplines like boxing, kickboxing and mixed martial arts to live a fit lifestyle." Last week, at Fight for Peace's Academy in London, Reebok announced its long-term commitment to Fight for Peace, which was founded in 2000 by Luke Dowdney MBE, a former amateur boxer and British light-middleweight Universities champion, as well as the acquisition of LUTA Sportswear, an authentic boxing and MMA brand, also founded by Dowdney to help support Fight for Peace's mission. "Our partnership with Reebok is incredibly exciting for Fight for Peace and its future and Reebok entering into this long-term deal with the UFC will magnify the positive impact and reach of this partnership," said Dowdney. "Reebok and Fight for Peace have a shared belief in the power of fitness – and specifically fight training - and the impact it can have on young people's lives, particularly those who are impacted by crime and violence. Today's announcement between Reebok and the UFC will help us continue to build international awareness for the Fight for Peace mission, allowing us to reach even more at risk young people globally."